With every new Windows Update, Microsoft is trying to make Windows a best Operating System. Although, Windows isn’t open-source software like Linux. But, still, Microsoft allows to install it on any system using ISO. Yes, later Windows does require activation. But, that’s completely ok. And, due to the flexibility of Windows OS. It does work on every custom build computer. But, sometimes, computer hardware creates conflict with Windows OS. That’s why Windows shows – Your PC ran into a problem needs to restart. Microsoft has designed these stop code itself. So that Windows can prevent the system to harm. Whenever a serious software or hardware problem arises. And, the user could able to fix the problem with the help of error code. My whole point is, when computer shows, your PC ran into a problem. You need to find out the actual error. So that, you can able to try the specific solutions related to that BSOD error. But, if you’re unable to find out the solution to fix that BSOD error. Then, this article might be helpful for you. BSOD Error can occur due to multiple reasons. Faulty, corrupted and incompatible Device Driver. Due to corrupted system files. Or maybe a virus attack on the system. 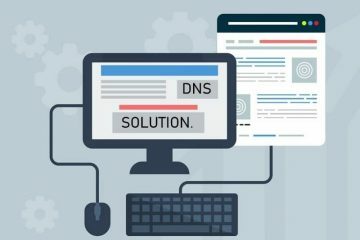 Well, whatever is the reason, here are some common solution mentioned. Which you can try when any BSOD error screen does appear. 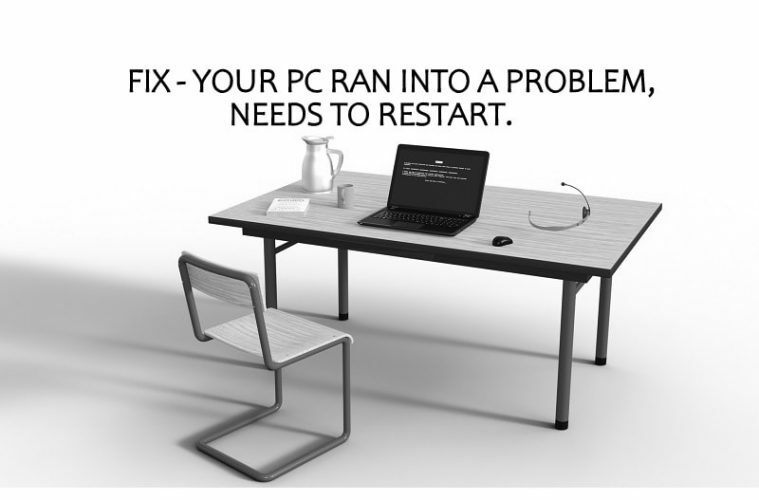 1 Fix – Your PC ran into a problem needs to restart. 1.1 Remove recently connected hardware. 1.2 Boot Windows into Safe Mode. 1.3 Uninstall Recently Installed Software. 1.8 Check Disk for Errors. 1.9 Modify Memory Dump Settings. 1.10 Restore Windows or Clean Install. Fix – Your PC ran into a problem needs to restart. Before start trying out software related solutions. First, you need to do some hardware related troubleshooting. It could possible that connected peripheral devices are causing this BSOD problem. So, I suggest you remove all USB devices, except keyboard and mouse. Also, it might possible that you have recently added some hardware parts. And, that is causing trouble for you. For example – Adding wrong frequency incompatible RAM can cause BSOD errors. Also, it can harm your Computer. Well, I am not talking about RAM only. It could be any hardware that you have recently added to your CPU. So, just turn off your computer completely and then remove that hardware. And, after that, try to start Windows. Boot Windows into Safe Mode. If you’re unable to start Windows. Means, every time you start your Computer, this screen appears, “Your PC ran into a problem, needs to restart”. Then, first, you need to boot your Computer into safe mode. After that only, you will able to fix this problem. 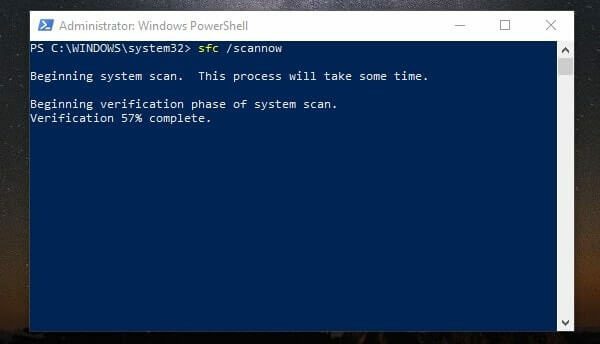 Safe mode is basically a diagnostic mode of Windows. That allows only essential system programs and services to start up at boot. So, if any third party software is causing trouble in Windows boot. Then, in safe mode, that software will not run. So, in safe mode, you can easily fix BSOD error, by uninstalling that particular program. Though, there are various ways to boot Windows into safe mode. But, if Windows fails to boot. Then, there are three ways left to boot Windows into safe mode. Use Windows 10 installation drive and CMD. Use a Windows 10 flash USB recovery drive. All these three methods you can find out on the Internet. But still, I will tell you first method in short. 2. Click on Advanced options > troubleshoot. 3. From troubleshoot Window, click on advanced options > startup settings > restart. Note: If startup settings option doesn’t appear. Click on “See more recovery options”. 4. After Windows 10 restarts, you can choose boot options. For Standard Safe Mode, press the 4 or F4 key. IMPORTANT – Instead of booting Windows into safe mode. You can also select “Startup repair” option. Which is available in Troubleshoot > Advanced options. Startup repair will automatically fix all boot issue. 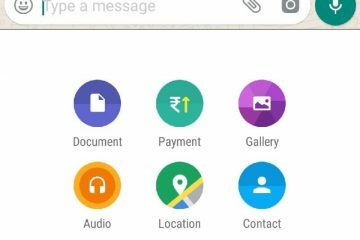 Exit from safe mode – If after trying out all next solutions. If you want to exit from safe mode. Then, open system configuration Window. Go to boot and unmark safe mode and then click on OK. And, after that, restart Windows. After booting Windows into safe mode. You have to uninstall all third-party program that you have downloaded. It could be an antivirus program or can be an overclocking software. Whatever it is, just uninstall it by going into, “Control Panel > Uninstall a program”. Apart from a third-party program, this problem can occur after a Windows update. If you have recently installed a Windows update or driver update. Then, I suggest you uninstall it. Yes, you can revert back to the previous version of Windows. 1. 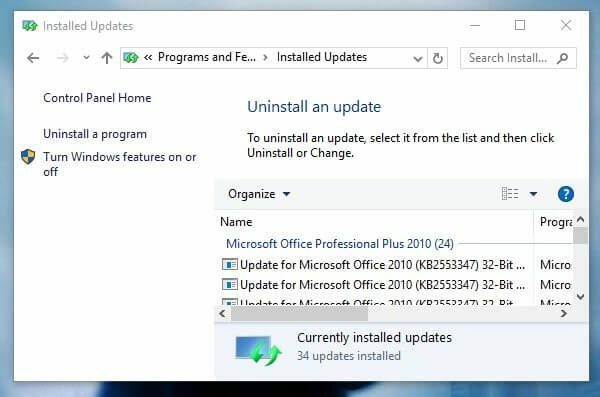 Open Control Panel > Uninstall a program > View installed updates. 2. Here you will able to see all recently installed Windows update. 3. Check the date of update installation in “installed on” Section. That will help you to find out the most recent Windows update. 4. Just right-click on that update and choose “Uninstall”. Don’t uninstall old Windows updates. It could lead you to many errors. This solution is worth trying. When Your PC ran into a problem needs to restart, the problem does appear. SFC stands for System File Checker Tool. It is a Microsoft utility, that allows the user to scan and restore corrupted system files. The utility replaces corrupted files with a cached copy of Windows. And, cache copy of Windows is located in a compressed folder at %WinDir%\System32\dllcache. How to perform an SFC Scan. 1. Right-Click on the Windows 10 start button. And, then click on “Windows PowerShell (Admin)”. 2. UAC Windows will appear, click on Yes. 3. Type the following command in Windows PowerShell. And press enter key. Instead of Windows PS, you can use the Command prompt. And, SFC scan takes time, so, don’t close scanning. First, you have to find out the BSOD error code. And, if the error is related to a driver software. Then, you need to first uninstall that driver. And, after that, reinstall the Driver. 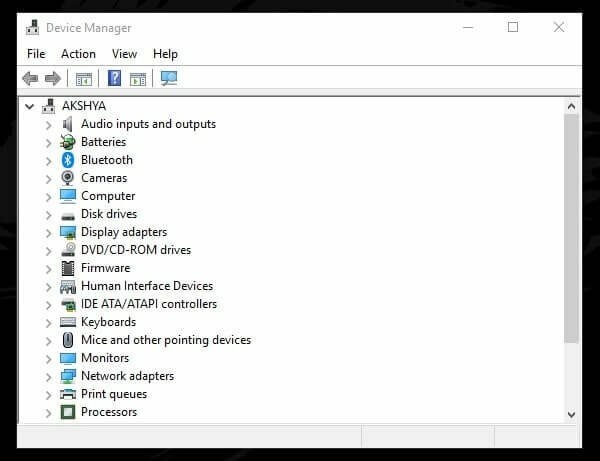 You can manage drivers using device manager. To open device manager. Press Windows + X key simultaneously, and then click on device manager. If you’re facing error like “system thread exception not handled” or “system service exception“. Then, the problem is definitely with some driver software. 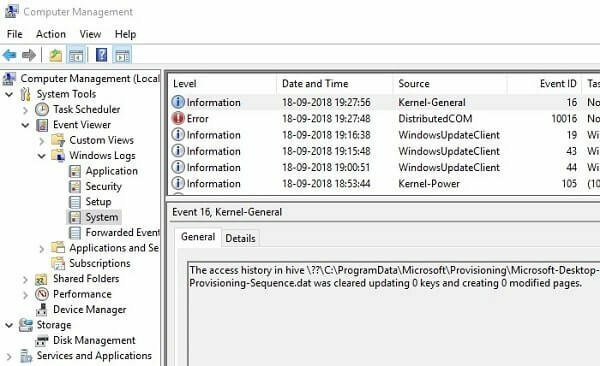 In this case, event viewer can help you to find out the faulty driver. To open event viewer, first press Win + R key. Type eventvwr in run Window and press enter. Event viewer will get open. Click on Windows Logs > System. Here you will able to see all BSOD error details. And, what is causing the “Your PC ran into a problem needs to restart” error screen. In most of the cases, CPU overheating is the main reason behind the “Your PC ran into a problem needs to restart” Error. It could possible that due to overclocking CPU is getting much strain. When CPU temperature reaches 90-degree Celsius or higher. You will experience an abnormal amount of heat. Though, you can check your CPU temperature using a best CPU temp monitor software. Well, to fix CPU temperature temporary, shut down your Computer for 30 minutes. CPU overheating problem normally occur due to broken heat sync, non-working cooling fan, and bad airflow case. In many cases, a corrupted disk can be the reason behind this problem. So, I suggest you run a disk check on your Windows drive. Open Command Prompt or Windows PowerShell. In my computer, Windows is installed in C drive. That’s why I am checking C drive. 1. Open Run Window (Win + R key), type sysdm.cpl and press enter. 2. Click on the advanced tab in system properties Window. 3. 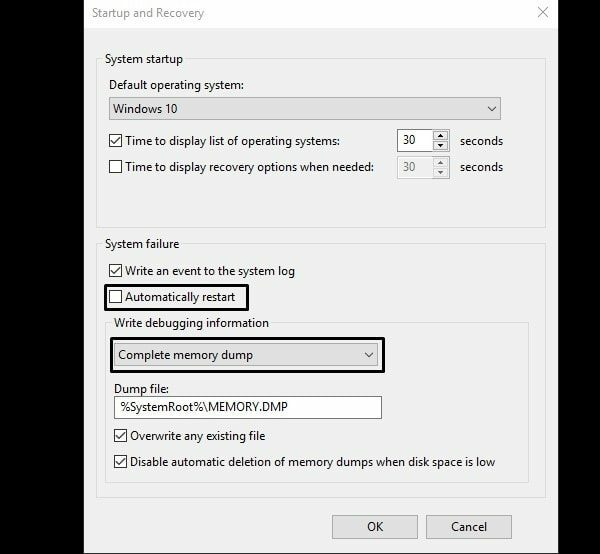 Under startup and recovery, click on “Settings” option. 4. Now, in startup and recovery settings Window. First, unmark “Automatically restart” option. 5. After that, in write debugging information drop-down menu, select “complete memory dump” option. And, click on OK. Restore Windows or Clean Install. If you have created a backup point. Then, simply restore Windows from that backup. And, if you haven’t created. And, still facing “Your PC ran into a problem needs to restart” problem. Even, after trying out these solutions. Then, you need to reinstall Windows. First, download Windows ISO, and create bootable media using USB Drive. And, then you can install Windows Again. Though, these solutions will fix your problem. If you follow them properly. I suggest you look specifically for the error code. You will definitely find out the right solution. 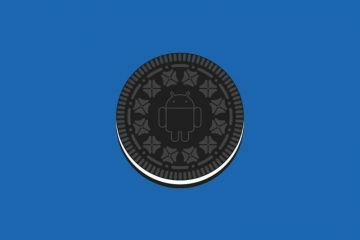 Previous ArticleHow to increase mobile conversion rates? Next ArticleBest VR Player Apps for Android to Watch VR Content. 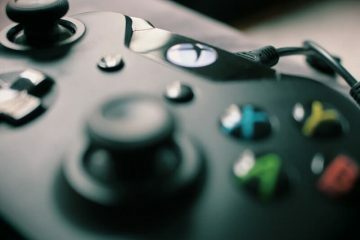 Xbox one Emulator for PC – Play Xbox One Games on PC. 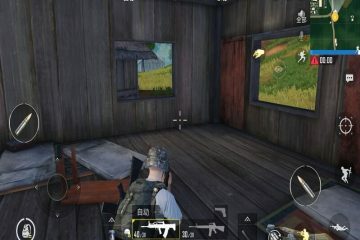 How to Download and Install PUBG Mobile Sanhok Map.